I am delighted to report that there is a new version of the Nigerian spam you may have been used to getting. Over the last few years I have been getting more or less the same email promising riches somehow associated with Nigeria. It was getting stale. However, it looks like a new version is out, and I am including it here, in case you haven’t seen it already. (No doubt you eventually will). I write this august letter in confidence, believing that it will reach you in high spirit and I believe you will maintain the level of confidence and trust matters of this nature requires. Though, I know that this proposal may make you apprehensive and worried, but I assure you that all will be well at the end. business text book from reliable fellow working with the Nigerian Chamber Of Commerce and Industries.Opportunity comes in life only when nature wishes that the wind will blow towards you but that does not mean you are the only person on earth. I want to believe you have been praying for sometime now, for divine blessing so that you can take good care of your family, but how would you know when one comes your way? from me, then we shall reap from the land of milk and honey and all your difficult days will be over. Before i proceed in details, i demand that you in confidence assure me that you will comply to the rules and regulation of this business. The rules are as follows: Promise to be faithful. Promise to be sincere, Promise to be your brother’s Keeper, Promise that you will assist morally, spiritually and financially to your own ability.If you are in compliance to this conditions, then i have no option than to tell you the full details of the business. The story and the business in full. I am the personal attorney / sole executor to the late Mr Norbert , hereinafter referred to as ‘my client’ who worked as an independent oil magnate in my country. and who died in a car crash with his immediate family on the 4th of oct,2005. Since the death of my client in oct,2005, I have written several letters to the embassy with an intent to locate any of his extended relatives whom shall be claimants/beneficiaries of his abandoned personal estate and all such efforts have been to no avail. Moreso,I have received official letters in the last few weeks suggesting a likely proceeding for confiscation of his abandoned personal assets in line with existing laws by the bank in which my client deposited the sum of 15 million USD On this note i decided to search for a credible person and finding that you bear a similar last name, I decided to contact you, that I may,with your consent, present you to the “trustee” bank as my late client’s surviving family member so as to enable you put up a claim to the bank in that capacity as a next of kin of my client. I find this possible for the fuller reasons that you bear a similar last name with my client making it a lot easier for you to put up a claim in that capacity.I propose that 45% of the net sum will accrue to you at the conclusion of this deal in so far as I do not incur further expenses. Therefore, to facilitate the immediate transfer of this fund, you need, first to contact me via signifying your interest and as soon as I obtain your confidence,I will immediately appraise you with the complete details as well as fax you the documents, with which you are to proceed and i shall direct on how to put up an application to the bank. HOWEVER, you will have to assent to an express agreement which I will forward to you in order to bind us in this transaction. Upon the reciept of your reply,I will send you by fax or E-mail the next step to take.I will not fail to bring to your notice that this proposal is hitch-free and that you should not entertain any fears as the required arrangements have been made for the completion of this transfer. Like I have implied, I require only a solemn confidentiality on this. The required information shall be use in the procurement of all documents relating to this transfer and it shall be in your name as the beneficiary and administrator. Your ability to keep this transaction absolutely confidential will be much appreciated. Please, confirm your willingness by promising that you will keep to the rules and regulation and your effort will never be divided both financially and otherwise. I look forward to receiving your compliance and we swing into action. Call me on +234 80-36599857 for moral and important discussion . Needless to say, when you do get this email, add it to your spam list. Thanks for using My Starbucks. We are excited to announce that, as of next week, My Starbucks’s name and functionality will be changed to SpeedDate. Data entered into the original app won’t be used anymore. Soon you’ll be able to try SpeedDate, the fastest way to meet new people, so stay tuned! And for people who may — or may not — understand my references, there is THIS! Thanks to Tim O’Reilly — via twitter, no less — for the pointer. I think you would be hard pressed to find one Canadian who did not possess these qualities. Ty Toys shamelessly cash in on the Obama girls…. …by coming out with two new dolls named after them. Sad. Apparently Michelle Obama is not happy about it. I wouldn’t blame her. I think it’s inappropriate and I would avoid buying toys from Ty unless I hear it’s been resolved. As mobile phones combined with Internet services gain more and more capability, the era of ubiquitous computing will begin, whereby everyone in the world will be able to digitally interconnect. 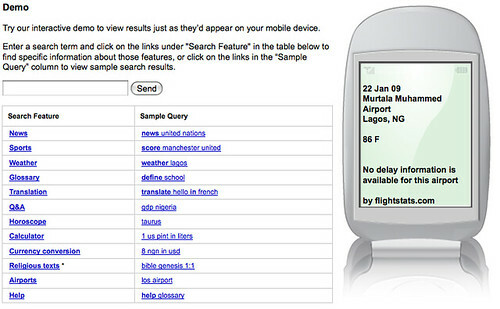 One more step along that path is occurring with the announcement of Google’s SMS Search in Ghana and Nigeria (as reported on the great blog, White African). The device most of the world will connect to the Internet with will not be a Mac or an PC: it will be a low cost mobile phone/handheld device. Companies like Google will supply everything else. And it will happen very soon. Just how bad was John Thain? Over at TPMMuckraker, part of Talking Points Memo, they have John Thain’s Top Ten Greatest Moments. And by great, they mean just the opposite. There’s outrageous expenses, trashing of furniture, and those are the minor items. At best, you’ll be shaking your head. More likely you’ll be thinking: this guy ought to go to jail.